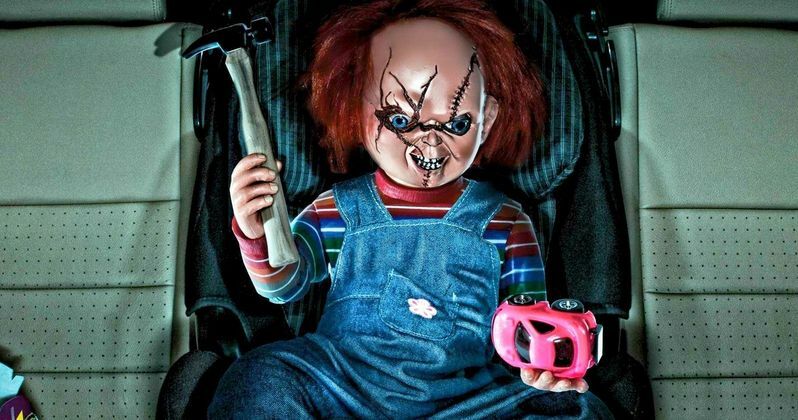 The California Highway Patrol had a good laugh after they pulled over a driver who was using a Chucky doll from the Child's Play movies as his carpool passenger. The driver took the proper precautions and made sure to buckle Chucky up, which surely avoided another ticket for not having him strapped in. Apparently the dolls have found a new form of popularity in the Bay area since John Gruden has returned as head coach of the Oakland Raiders. Football fans believe that the head coach closely resembles Chucky and they bring the doll with the iconic scowl to games. A California Highway Patrol officer pulled over a driver last Thursday around 4 PM on Highway 4 after noticing something peculiar about the driver's carpool passenger. Many people have been wrongly pulled over due to officers not being able to see small children in the car, but the horror icon was clearly seen by the ticketing officer. Patrol spokesman Officer Brandon Correia said that he often asks for funny pictures to be sent to him from out on the road, but stated that Chucky takes the cake as one of the most random and humorous things that he's seen yet. Drivers in California must have at least two passengers to drive in the carpool lane, Brandon Correia said. They did not release the name of the clever driver, but they did however post a picture of the possessed Good Guys doll buckled in on the Contra Costa Twitter account. Correia tweeted a photo of the killer doll on the patrol's Twitter account with the caption that reads. "We know Jon Gruden is back, and we love it too, but this will definitely not work as your carpool passenger! But hilarious! A for effort,... and here's your carpool ticket." It would have been pretty interesting to be around for the exchange between the driver and the officer who pulled him over. It would have been even better if Chucky took over the conversation, telling the driver to "Shut up and drive, before I kick your teeth in." Despite the laughs that the California Highway Patrol shared, the driver was still given a ticket. The carpool violation tickets start at $481, but they can quickly escalate and they count as a moving violation, which counts against a California license. Though the driver still received a hefty ticket, he has provided a lot of laughs from the California Highway Patrol as well as Child's Play fans all over the world. The driver may have been just reenacting the scene from Child's Play 2 where Chucky forces Kyle to drive him to Andy, but that theory has not been proven. It is more than likely that Chucky was used to sit shotgun to avoid California rush hour traffic, which is completely understandable. You can check out the picture of Chucky sitting shotgun, all buckled up for safety below, courtesy of the The CHP Contra Costa's Twitter account.